URGENT >> BULLETIN >> MOVING: (17th update 3:07 p.m. ET U.S.A.) The U.S. Securities and Exchange Commission has charged “Achieve Community” (as Work With Troy Barnes Inc.) and alleged operators Troy A. Barnes and Kristine L. Johnson with operating a combined pyramid- and Ponzi scheme that raised more than $3.8 million. A federal judge in Colorado has ordered an asset freeze and granted a temporary restraining order. “Johnson and Barnes allegedly claim to be operating a successful investment program when in fact they are taking funds from new investors to pay phony profits to earlier investors,” said Julie Lutz, director of the SEC’s Denver Regional Office. Achieve’s internal structure is part of the probe. Meanwhile, the Colorado Division of Securities confirmed minutes ago that it was working with the SEC on the Achieve probe. The Feb. 12 filing date likely means that Achieve still was trying to raise money even as the SEC was in court to request an emergency asset freeze. On Feb. 12, a Barnes-narrated video appeared on YouTube. The 11:06 video was titled “Thursday Update 2 12.” The video provided Achieve members instructions on how to register for a purported new payment processor. By Feb. 14, Achieve members were quoting a forum post attributed to Barnes that Achieve’s assets had been frozen. Whether a criminal probe is under way is unclear. Barnes is 52. He resides in Riverview, Mich., according to the complaint. Johnson, known as “Kristi,” is 60. She resides in Aurora, Colo.
Johnson also is associated with an entity known as “Achieve International LLC,” which has been named a relief defendant as an alleged recipient of funds from the fraud. Some Achieve members have described Johnson as a “former stockbroker.” The SEC’s allegation that she is a former registered representative may be particularly problematic for her, leading to troubling questions about whether she simply ignored the very real possibility that the SEC would do exactly what it did: charge her with securities fraud and allege she and Barnes made “material misrepresentations and omissions” about the nature of Achieve. The SEC accuses both Johnson and Barnes of misappropriating funds sent in by Achieve investors. In addition to making Ponzi payments to investors, Defendants have misappropriated investor funds for Johnson and Barnes’ own personal use. On more than a dozen occasions, Johnson made significant cash withdrawals or wrote checks to “Cash” from the WWTB and Achieve International accounts, and made corresponding cash payments to her personal accounts. Johnson used these investor funds to pay her personal expenses, including paying nearly $35,000 in cash for a new car, and making personal credit card payments. To date, Johnson has misappropriated at least $150,000 in investor funds. Similarly, Barnes has misappropriated investor funds. Using thirteen separate transfers reflected on WWTB bank statements as “Visa Paypal *Troy Barnes,” Johnson transferred approximately $40,000 to Barnes. The seal on the complaint was lifted yesterday afternoon in Colorado federal court. Achieve’s websites went offline yesterday. Whether the outage was related to the TRO was not immediately clear. What is clear is that the SEC wasn’t impressed by Achieve’s claims that a “triple algorithm” somehow made a 700-percent ROI possible. It’s also clear that the SEC spent plenty of time listening to and transcribing recordings used to sell the scheme. Barnes claimed he hired a programmer “who spent three months perfecting the ‘triple algorithm’ investment formula,” the SEC said. With their “triple algorithm” cover story, Johnson and Barnes went on to fleece Achieve members, the SEC said. She was hardly alone, the SEC charged. The SEC said its investigation was ongoing. Johnson is the only person alleged in the Feb. 12 complaint to have hauled $100,000 or more out of Achieve. Johnson and Barnes are charged with securities fraud. And despite claims online that Achieve wasn’t selling an investment or a security and therefore the SEC would have little or nothing to say on the matter, the filing of the complaint shows those claims were a crock. 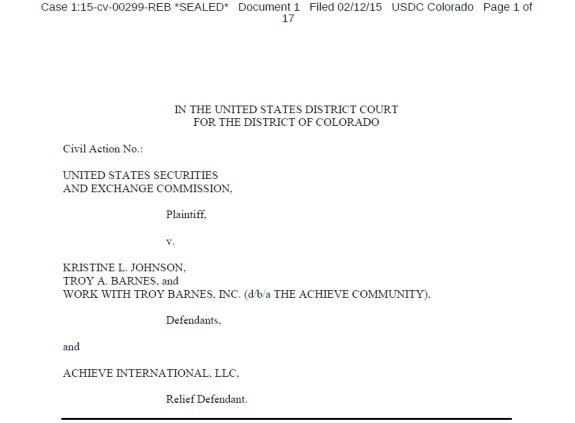 Achieve’s “positions” are “securities under federal law,” the agency charged. U.S. District Judge Robert E. Blackburn granted the TRO and asset freeze. Achieve had a presence on well-known Ponzi-scheme forums such as MoneyMakerGroup and TalkGold. Some Achieve promoters created YouTube videos and have moved to other Ponzi-board scams. Here is a link to the SEC’s statement on Achieve and complaint. The agency also posted a Twitter link (below). Tags: Achieve Community, Achieve International LLC, Colorado Division of Securities, Colorado Securities Act, Julie Lutz, Kristi Johnson, Kristine L. Johnson, Lillian Alves, MoneyMakerGroup, SEC, SEC Denver Regional Office, TalkGold, Troy A. Barnes, Troy Barnes, U.S. District Judge Robert E. Blackburn, U.S. Securities and Exchange Commission, Work With Troy Barnes Inc.
Nous sommes deux victimes de Kristi et Troy et je peux vous fournir les captures écran de nos comptes. Rasmont Christine: Nous sommes deux victimes de Kristi et Troy et je peux vous fournir les captures écran de nos comptes. Let’s see how long it takes for the members to start with the “evil” government claims, all the conspiracy claims, and if it weren’t for the “haters” Achieve would have been just fine mantra. I’m sure you’re aware, Lynn, that the evilGUBment claims and the conspiracy theories started a few days ago (at least). They might not gain much of an audience this time. This is because one of the SEC analysts on the case is a Ph.D. whose doctorate in Economics came from the Massachusetts Institute of Technology. Man, what a CV this woman has! She also studied in Chile and the Dominican Republic, two places that know poverty and are trying to reverse it. While a student in the DR in 1997, she received the National Youth Prize. These days, if you run a “triple algorithm” Ponzi-board scheme targeted at vulnerable populations yearning for a better economic life, it looks as though you might have to go up against an MIT Ph.D with international experience and an entrepreneurial spirit. Not to mention highly trained securities lawyers and investigators. I´ll only have my all money back so should that be good but put this 2 Kristi & Troy in jail for many yrs also and not in USA,in Mexico instead,much better for them,will have back my $54,000,00 from this 2 real scammers or if some other can help all of us with that,sell hers car and put in all money into an real good and safe bank account and not into any scam account as they had.Hope to hear from you soon.I´ll follow this now untils it over and we all had our money back.Hang them high. PatrickPretty.com: U.S. District Judge Robert E. Blackburn granted the TRO and asset freeze. The SEC investigation is ongoing, and there can be no doubt the SEC is aware of the Achieve promos by Rodney Blackburn of Ohio. It’s a shame that members had faith in 2 people who scammed them. I watched as the scheme unfolded when they said they had a problem with the processor and handing out payments. That tripped a flag for me. I warned others. They all had this false sense of security that this was real but after weeks of no processor I was convinced this was a sham. If it’s too good to be true then it probably is. I’ll work for my money until the day I can’t anymore. I don’t need to cut corners I don’t need to find another way to make money. I have a job. I’m getting by but it works.